The Moringaceae is woody and distributed from India to East Africa, a part of West Africa, and Madagascar. Moringa oleifera is used as vegetables for their leaves and seed pods. Seeds contain positive charged proteins and are crushed to be used for water purification to precipitate negative charged soils and dirty matters (Ghebremichael et al. 2005). Ghebremichael, K. A., Gunaratna, K. R., Henriksson, H., Brumer, H., and Dalhammar, G. (2005) A simple purification and activity assay of the coagulant protein from Moringa oleifera seed. Water Res 39: 2338–2344. 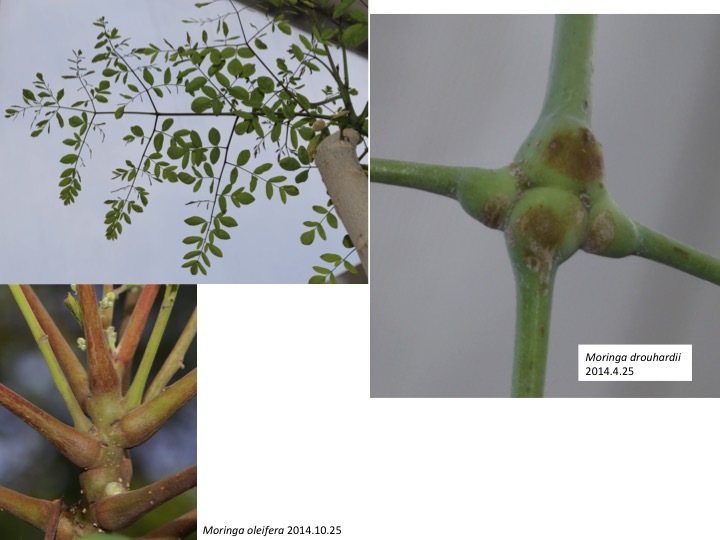 Species with bottle-like water storage stout stem including Moringa drouhardii form a basal paraphyletic grade. Species with slender woods and those with water storage stout root form sister clades. Olson, M.E. 2002. 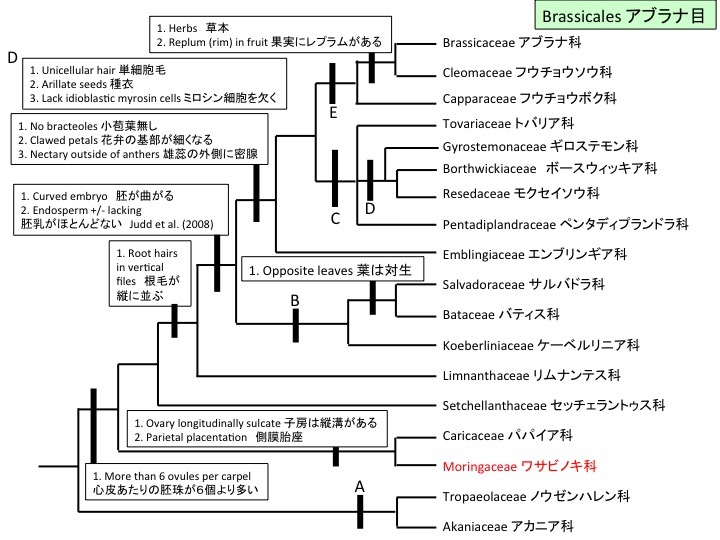 Combining data from DNA sequences and morphology for a phylogeny of Moringaceae (Brassicales). Syst. Bot. 27: 55-73. Olson and Rosell (2006) compared xylem and phloem among Moringa species. They found that the development of stems in slender trees or tuberous shrubs is similar to that of early developmental stages of bottle tree stems. With incorporating the basal clustering of bottle trees in the Moringa phylogenetic tree (Olson 2002), they speculated that non bottle trees evolved by neoteny of bottle trees: delayed developmental process. It is still unknown how developmental networks are reorganized. Olson, M.E., and Rosell, J.A. (2006). Using heterochrony to detect modularity in the evolution of stem diversity in the plant family moringaceae. Evolution 60: 724-734. 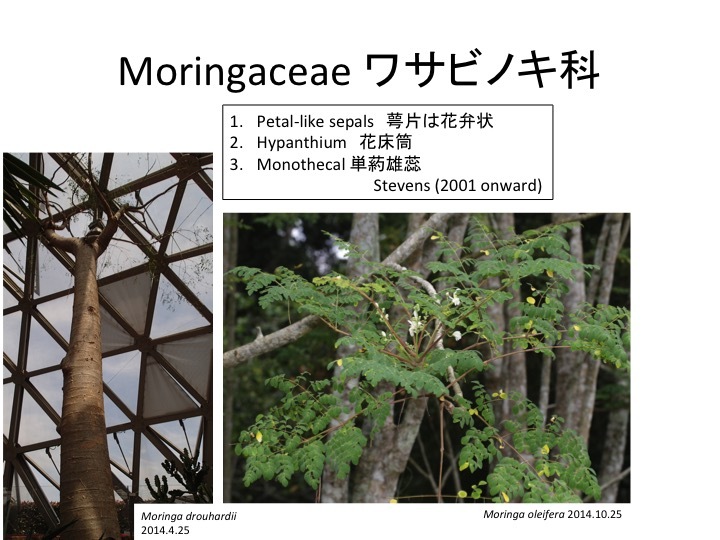 The genus Moringa includes 13 species, in which four and nine species form actinomorphic and zygomorphic flowers, respectively. 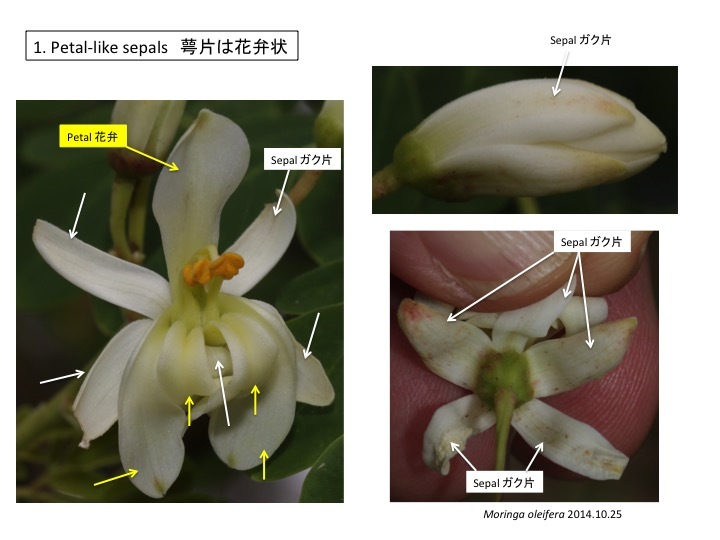 Olson (2003) showed that early floral buds are zygomorphic in any species regardless of their matured flower types. Olson, M.E. (2003). 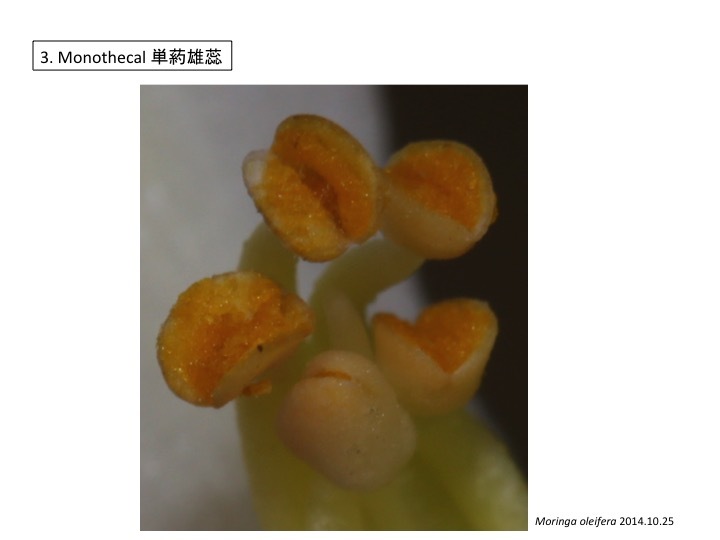 Ontogenetic origins of floral bilateral symmetry in Moringaceae (Brassicales). Am J Bot 90, 49-71. CYCLOIDEA (CYC) encoding a transcription factor in Antirrhinum majus is expressed in the adaxial side of a floral primordium. The loss of function of CYC changes wild-type zygomorphic flowers to actinomorphic ones and CYC regulates asymmetry in flower development (Luo et al. 1996). Even though Flowers of Arabidopsis thaliana is actinomorphic, TCP1, CYC ortholog mRNA is asymmetrically expressed only in adaxial side during stages 1 and 2, and after stage 3, the expression diminishes (Cubas et al. 2001). 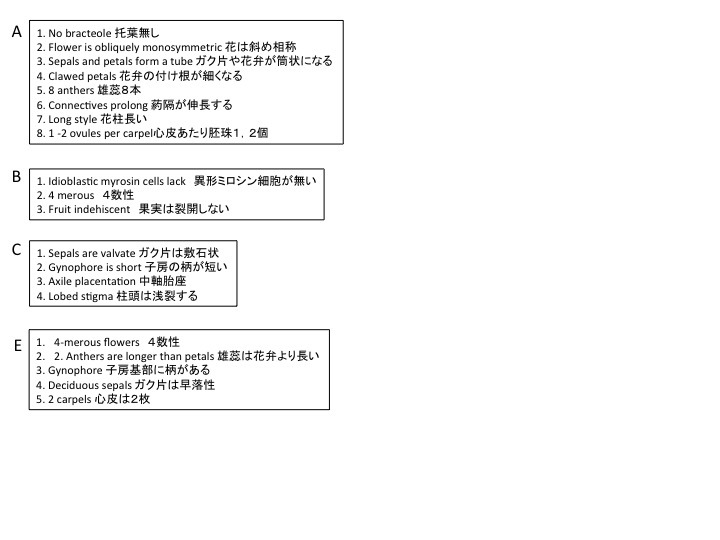 These suggest that actinomorphic developmental program functions after zygomorphic one does. This is similar to the case in Moringa. Cubas, P., Coen, E., and Zapater, J.M. (2001). 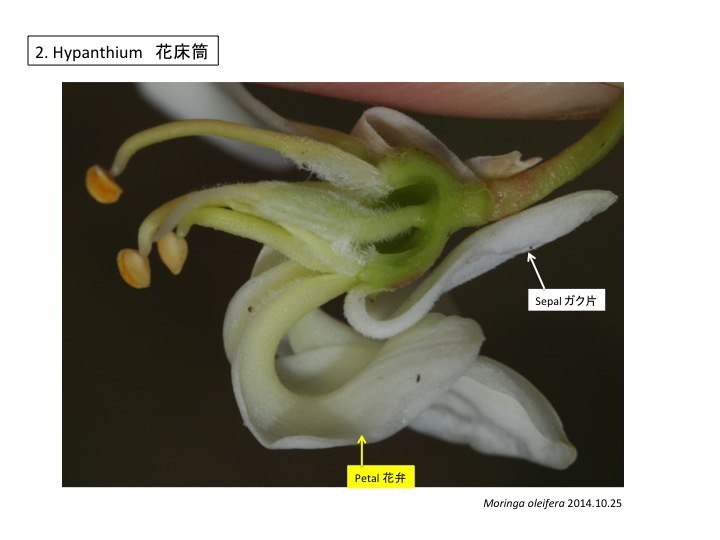 Ancient asymmetries in the evolution of flowers. Curr Biol 11, 1050-1052. Luo, D., Carpenter, R., Vincent, C., Copsey, L., and Coen, E. (1996). Origin of floral asymmetry in Antirrhinum. Nature 383, 794-799. Carica papaya in the Caricaceae, sister to the Moringaceae forms actinomorphic flowers and the primordia do not pass the zygomorphic stage as in the Moringaceae, although expression patterns of CYC homologs have not been examined. 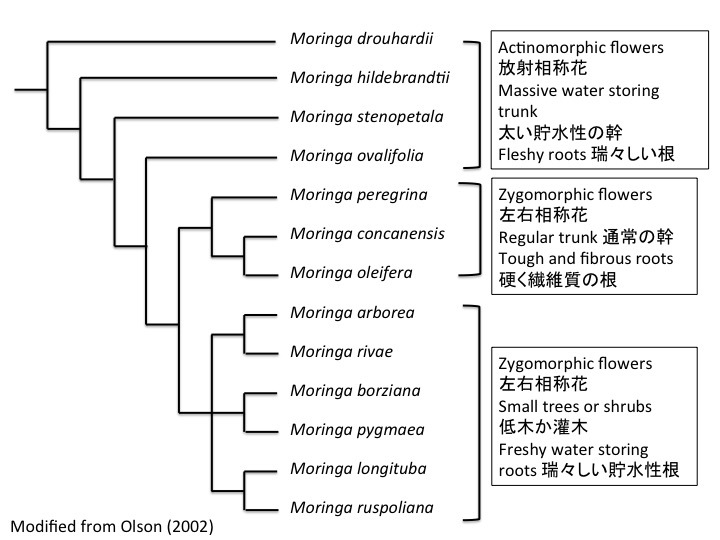 Why zygomorphic development is proceeds to actinomorphic one in the Moringa species and Arabidopsis thaliana? Ronse Decraene, L. P., and Smets, E. F. 1999. The floral development and anatomy of Carica papaya (Caricaceae). Can. J. Bot. 77: 582-598. An axis of a zygomorphic flower is usually formed on the line connecting a shoot apex and a bract. 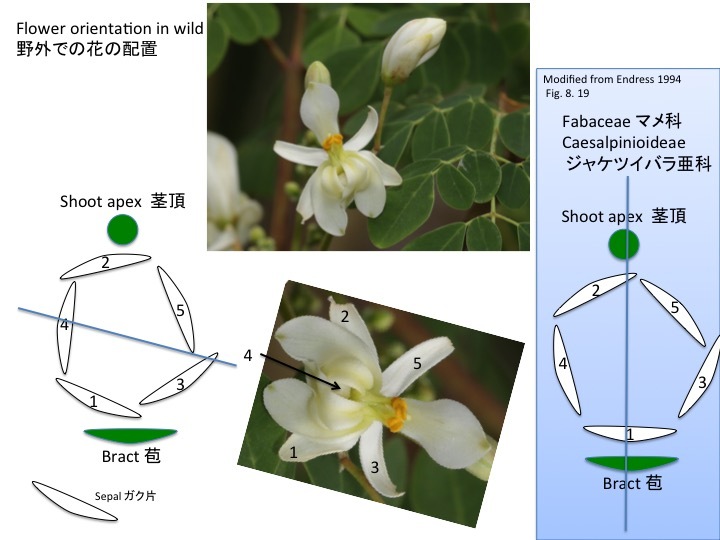 The zygomorphic flowers of Moringa have an axix oblique to the line connecting a shoot apex and a bract. Analyses of genes involved in zygomorphic flower development such as CYC will give insight on the molecular mechanisms to form the axis. Bases of pinnae and leaves are articulated, although the reason is unknown.